Previously we have harped about ancient Sumerian music, Greek music and even the Hurrian musical piece that pertains to the world’s oldest known song. But this time around, we have decided to take the more ‘hip’ route by presenting the music of the proverbial ‘next generation’ in history – the medieval generation that was culturally separated from the ancients by the rigors of millennia and yet preserved the joie de vivre of their ancestors in their own inventive manner. 1) 0:00 – 1:19, a salterello, often modernly called La Regina; origin – circa late 14th or early 15th century Italy. 2) 1:20 – 2:15, La Quinte Estampie Real from the manuscript called Chansonnier du Roi; origin – circa second half of 13th century. 3) 2:16 – 3:31, an excerpt (the first part) from Tre Fontane, an estampie; origin – circa late 14th or early 15th century Italy. 4) 3:32 – 4:00, Schiarazula Marazula by Giorgio Maineri; origin – mid 16th century. 5) 4:00 – 5:21, La Quarte Estampie Royal, from the manuscript Chansonnier du Roi; origin – circa second half of 13th century. 6) 5:22 – 6:40, a salterello (popularly the “Dead Can Dance Salterello”); origin – circa late 14th or early 15th century Italy. 7) 6:41 – 7:30, Saltarello Ungaresca; origin – possibly the Renaissance epoch. Now if we take a glance at the aforementioned medieval playlist we can certainly discern that many of these mirthful tunes are based on salterello. Derived from the Italian verb saltare (“to jump”), saltarello is basically a type of vigorous musical dance that probably originated in medieval Italy (as evidenced by a 14th-century Tuscan manuscript that contains the first known mention of the dance). 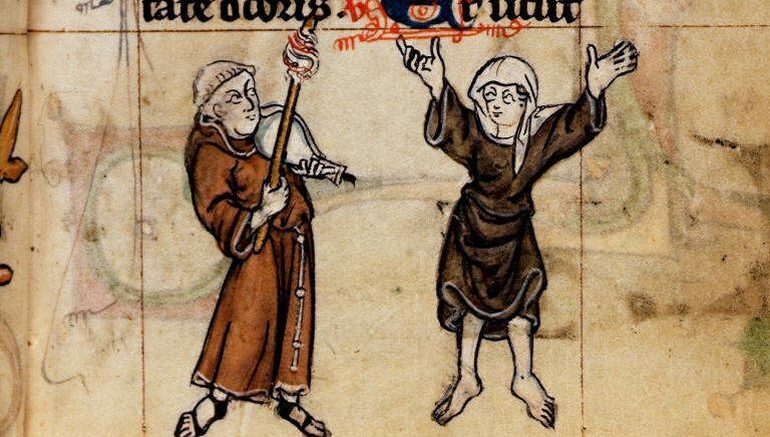 Now interestingly enough, the early saltarello tunes in themselves were possibly inspired by the estampie, a European medieval dance and musical form that was popular in the earlier 13th-14th centuries. And finally, since the theme of this article is fun medieval music, for the last clip we have decided to shy away from a fully authentic historical scope and present a sprightly musical piece from Vox Vulgaris. Known as “Rokatanc”, the tune could indeed qualify for the medieval equivalent of rock’n’roll. The Swedish group in question here is known to use their fair share of bagpipes and percussion – and as we mentioned before, instead of focusing on historical accuracy, the band plays what can be termed as their interpretation of expansive medieval music.